Recently, I joined Automattic. This is a world-wide distributed company. The first three weeks you incarn a Happiness Engineer. This is part of the Happiness Rotation duty. This article explains why I loved it, and why I reckon you should do it too. Does it sound mad as a Cheshire cat? Pretentious maybe? Actually, it’s not at all. As a Happiness Engineer, I had to make the support. This is part of the Happiness Rotation: Once a year, almost everyone swaps its position to help our users. I will go back on this later. Find a way to fix the issues. I need motivations in my job. Learning who our users are, and what they want to achieve, is a great motivation. After these three weeks, I know what my contributions will serve. It gives a meaning to each contribution, to each day I wake up. Especially in a distributed company on Internet, our users are world-wide, they speak almost all the languages on Earth, they are present on all continents. Their needs vary a lot, they use our softwares in ways I was not able to foresee. When you are chatting with a “support guy”, you cannot imagine this is a real engineer. This is not a random person filling a pre-defined vague form somewhere where it is cheap to hire her. You will chat with someone very competent. Someone that has no superior. Someone that has all the tools to make you happy. Learn the culture of the company. This is why it is called Welcome to Chaos. Yes, you have to learn a lot in three weeks, but it is extremely educative. This is like a speed training. I can ensure that when a user is grateful after you fixed its issue, the term Happiness Engineer makes a lot of sense. Automattic provides a lot of freedom to their Happiness Engineers to make people really happy, both in term of tooling or financial. This is the first time I see a company that is that much generous with its customers. In addition to everyone willing to help, a buddy was assigned to me. A person that helps and teaches you everytime. This is very helpful. Thank you Hannah! This experience is great. But after some time, you might forget it. So as a reminder, once a year, you incarn a Happiness Engineer again. This is part of the happiness rotation. As far as I understand, it implies almost everyone in the company. Note: Obviously, there is permanent happiness engineers. I deeply think this approach has many advantages. Some of them are listed above. It helps to understand the company, and more importantly the users. The happiness rotation stresses the fact that users are central to Automattic, probably like any companies, but not with this care. Remember the creed: I will build our business sustainably through passionate and loyal customers . To have passionate and loyal users, you need to know them. For me, it was a great experience. It was chaotic at first, but it is worth it. Since April 2017, I have left Liip to join Automattic. After almost 20 months at Liip, I am leaving. Liip was a great experience. It was my first industrial non-remote job. It was also my first job in the country I am currently living in. And I have discovered a new way of working. Before working for Liip, I was working for fruux. My situation was the following: A french citizen, living as a foreigner in Switzerland, working for a German company, with employees from Germany, Holland, and Canada. Everything happened on chat, mail, and Skype. When my son was born, I had to change my work to simplify my life. It was not the only reason, but one of them. And before fruux, I was working for INRIA, a research institute in France. It was partially a remote job. Liip has several offices. I was based in Lausanne. So, yes, Liip was my first industrial non-remote job. And I liked it. Working in the train on the morning, walking in Lausanne, seeing real people, everything in my local language. Because yes, it was my first job in my native language too. Everything was simpler. And when you have your first baby, anything else that is simpler saves your life. Giant discussions were happening to remove any form of hierarchy in Liip. Then we discovered Holacracy, and we started moving to this system. This is a new governance system. If you are familiar with distributed network topologies in Computer Science, or data structures, it really looks like a Distributed Spanning Tree [DahanPN09]. Note: I am sure that the authors of Holacracy are not aware of DST, but, eh. So nothing new from a research point of view, but it is cool to see this algorithm coming alive in real life. And it worked: Less meetings, more self-organisation, more shared responsabilities, no more “boss” etc. This is not a tool for all companies, but I am sure that if you are reading my blog, then your company should give it a try. Liip has been very generous with me regarding my open source engagements. I was involved in Hoa, atoum, and Pickle when joining the company. Liip gave me a 5% budget, so roughly 1 hour per day to work on Hoa. Thank you for that! After that, I have started a new big project, called Tagua VM. They gave me an additional 5% budget. So I got 2 hours per day to work on Hoa and Tagua VM. Again, thank you for that! Finally, I have started an in-house open project called The A11y Machine (a11ym for short). 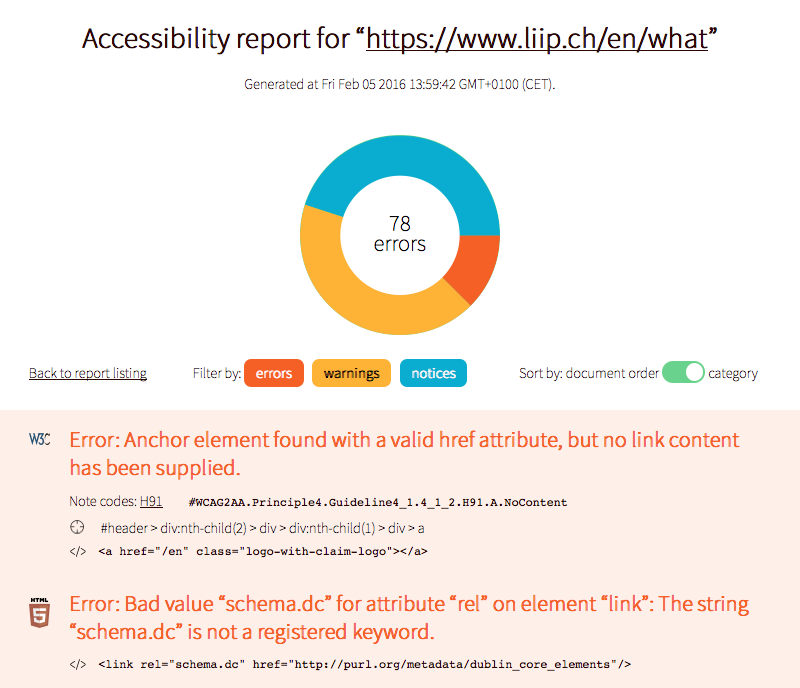 I have written a case study for this tool on the Liip’s blog: Accessibility: make your website barrier-free with a11ym! The goal of a11ym is to automate the accessibility testing of any site by crawling and testing each page. A sweet report is generated, showing all errors, warnings, and notices, with all information needed by the developer to fix the issues as fast as possible. 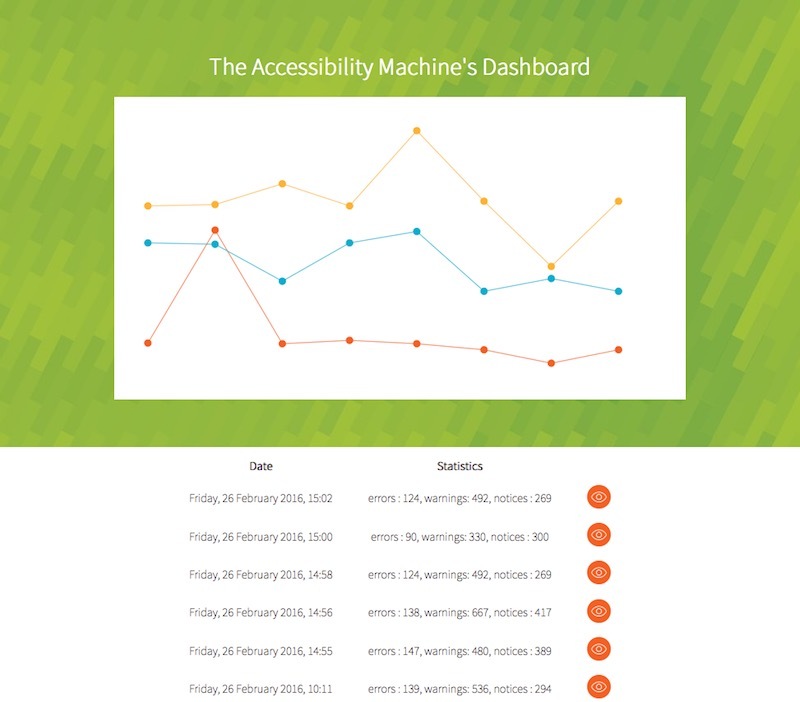 This project has received really good feedbacks from the accessibility community. It has been downloaded 7000 times so far, which is not bad considering the niche it targets. A new SaaS platform is being build around this software. I enjoyed working on it, and it was really tangible. Liip is a Web agency, so you have dozens of customers at the same time. However, I was in a special team for an important customer. The site is a luxury watches and jewellery e-commerce platform, located in several countries, in 10 languages, accessible from 16 domains, shared in 2 datacenters. This is not a casual site. I learned a lot about all the complexity such a site brings: Checkout rules (oh damned…), product catalogs in different formats for different countries with different references, all the business logic inherent to each country, different payment providers, crazy front end compatibilities etc. I have a hundred of crazy anecdotes to tell. This was clearly not a job for me at first glance: I am a researcher, I have an open source culture background, I am not tailored for this kind of project. But at the end of the story, I learned a lot. Really a lot. I have a better overview of the crazy things any customer can ask, or has to deal with, and the infrastructure craziness that can be set up. I learned how to make better things: How to transform a really crappy software into something understandable by everyone, how to not break a 10+ years old progam with no test etc. And it requires skills. I learned it the hard way, but I learned it. Because even if I learned during my time at Liip, the Web agency model was definitively not for me. I am very thankful to every Liiper, I had a great time, I love the Web, but not in an agency. My son is now 21 months old, and I need fresh air. I can take new challenges. Automattic is the company behind WordPress.com, WooCommerce, Akismet, Simplenote, Cloudup, Simperium, Gravatar and other giant services. I came to Automattic by coincidence. I was looking for a sponsor for Tagua VM, and someone pointed me out Automattic. After some researches about the company, it appears that it could be a really great place where to work. So I applied. The hiring process was 4 months long. It was exhausting because it happened at the same time than a big sprint at Liip (remember the SaaS platform for The A11y Machine?). But after 4 months, it appears I succeeded, and I am very glad of that fact! I am just starting my job at Automattic. I don’t have anything strong and finite to say now, apart that everything is just awesome so far. In few weeks, I am likely to write about my start at Automattic I did, see Welcome to Chaos. They have a very interesting way to get you on board.